In a sheltered bay on Scotland's west coast, on the banks of the River Inver, lies the village of Lochinver, an important fishing port despite its size. 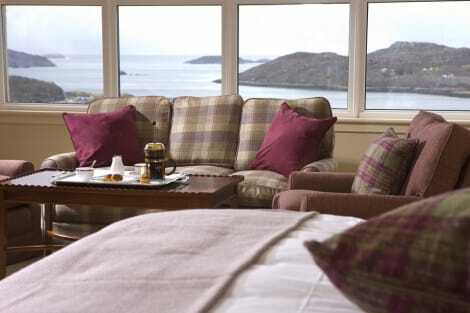 Book one of our Lochinver hotels and explore this pretty, white-painted village and the unspoilt countryside around it. As well as its huge fish market, Lochinver has a local crafts and produce market once or twice a month. Visit Highland Stoneware to watch the potters as they work on handpainted gifts and SEOSITE_LEVEL_DESCRIPTIONware, or the Little Soap and Candle Company in Drumbeg for handmade candles and soaps. In the same village is Drumbeg Stores, an independent grocer's which bakes its own bread and bottles its own whisky. Here you'll find all sorts of produce from the Highlands on sale, including handmade cheeses, chocolate, mead and shortbread, and handmade craft items, including wooden gifts made on the premises. The wild countryside of the Assynt region is filled with valleys, ancient woodlands, moors, mountains and lochs and is rich in flora and fauna. You can join a guided walk around the area with the Highland Council Countryside Rangers, who are based in the Assynt Visitor Centre in Lochinver itself. Other routes include the walk from Achmelvich to Altan'abrahan, which starts on a beautiful crescent-shaped beach and ends at a ruined mill, or a walk along the headland at Stoer. Here you'll see the Old Man of Stoer sea stack and enjoy excellent views of the Western Isles and the mountains of Sutherland. Look out for whales and dolphins, as well as seabirds including peregrines, twite, guillemots and razorbills. Ardvreck Castle, on the opposite side of Loch Assynt from Lochinver, dates from the 16th century. Once large and imposing, and thought to have had a walled garden and courtyard, it is now ruined, with just a tower and part of a wall remaining. Achmelvich is home to the Hermit's Castle, believed to be one of the smallest in Europe and easily reached on foot from the campsite. The castle was built in the middle of the last century by an English architect, but he stayed there only once, then left and never returned. It resembles both an anchorite's cell and a military pillbox, and no one knows quite what purpose it was designed for. Tuck into homemade Scottish classics and a range of seafood dishes at the family run Lochinver Larder, where there's also a kids' menu. A TripAdvisor Certificate of Excellence winner, the restaurant also has an online pie shop, Pies by Post, and can deliver to anywhere on the UK mainland. Peet's Restaurant serves seafood caught in the harbour which it overlooks, as well as locally caught fish and Highland beef. The Living the Dream tea van, found near Stoerhead Lighthouse, is also popular for its bacon rolls, freshly-made pancakes and homemade cakes. The van also sells postcards and calendars depicting the area.